MY Quick Shadow a steel vessel, built in 2006 to be a part of Bluewater Safaris Fleet. Boat offers to discover an underwater world of Egypt. 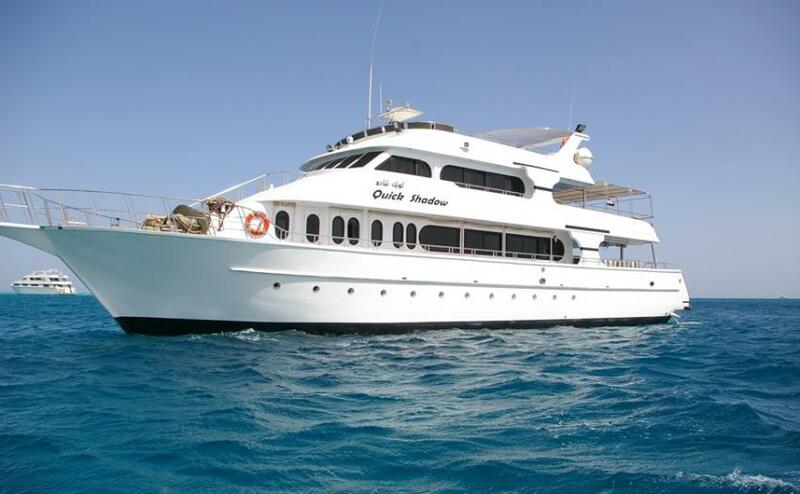 There are 10 cabins for 20 persons on board of Quick Shadow liveaboard. Twin and quad cabins are located on te lower deck. This rooms suited for sharing and for staying with family or friends. All has private showers and air conditioning. Deluxe cabins are located on the main and on the upper deck. This type of staterooms has big windows, in addition, wardrobes and lots of storage places for personal belongings. Big lounge area of MY Quick Shadow equipped with air conditioning, has a relaxing area with sofas combined with a dining zone. Here you can spend time in between dives or evenings, watch a movie or chat with other passengers on board. Passengers of Quick Shadow liveaboard can also relax on a sun deck. It has a shaded part and a opened part with soft comfortable sofas. Dive deck of Quick Shadow liveaboard has a lot of space to prepare for the dive and to maintain equipment after. You will find plenty of storage boxes and a hanging area for wetsuits. There are rinsing tanks for your gear and separate tank to rinse cameras after diving. Quick Shadow equipped with Bauer compressors and a Nitrox membrane. Quick Shadow liveaboard has a full range of safety equipment on board: life jackets, emergency rafts, first aid kit, etc. Members of a team are trained in fist aid. Diving itineraries of MY Quick Shadow include some of the best destinations of Red Sea like Brother Islands, reefs of Daedalus and Elphinstone, St. Johns.Daedalus and Elphinstone are true coral paradise. Plenty of wrasses unicornfish and groupers can be seen while diving on Daedalus. This is also a destination where hammerheads can be met. Elphinstone is known for a big variety for a great chance of meeting reef sharks, barracudas, and many other extraordinary creatures. Brother Islands is a well-known destination for diving in the Red Sea. It combines fine diving on reefs with wreck diving.There is a huge amount of gorgonian fans, black corals and soft corals here. On a Big Brother divers can also explore Numidia and Aida wrecks. Diving on St. Johns feature with hammerheads. These creatures are often met here by divers, especially when water temperature is not high. Egypt is an all year round destination. Water temperature and visibility is good for diving almost all the time. The best diving is in the Spring until the middle of the Summer. Summer months can be too hot, and not comfortable for diving safari. Autumn is great to take part in the trip too. Till December water temperature is comfortable and the winds are not too rough. Although winter months suits for diving as well, but you might need a thicker wetsuit.